Basics of Lung Ultrasound for the Nephrologist: What are A-lines and B-lines? Why should nephrologists perform lung ultrasonography? 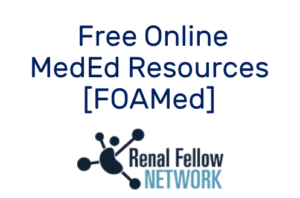 Determination of volume status is a frequent challenge faced by nephrologists in routine clinical practice and errors in this assessment may result in inappropriate therapy and potentially adverse patient outcomes. Lung ultrasound is an easy to perform, non-invasive and a dynamic parameter which allows to monitor for response to an intervention such as dialysis or diuretic therapy. It can be used alone or in conjunction with limited echocardiography and sonographic assessment of the inferior vena cava. B-lines seen on lung ultrasound provide semi-quantitative estimation of extravascular lung water, which is particularly important in critically ill patients and those with cardiorenal syndrome. 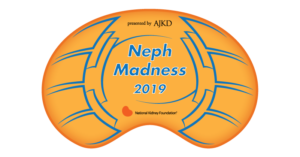 It is of note that in a recent randomized control trial, lung ultrasound outperformed chest X-ray and NT-proBNP based approach for the diagnosis of acute decompensated heart failure in patients presenting with dyspnea. Moreover, pulmonary congestion is highly prevalent even in ‘asymptomatic’ dialysis patients and the presence of B-lines is a strong, independent predictor of death and cardiac events in this population. Air in the lung: friend or foe? In general, evaluation of an air-rich organ is a limitation of ultrasound because air scatters the ultrasound beam and does not allow proper visualization of the underlying structures. Therefore, we cannot see the ‘lung tissue’ like we see the kidney on ultrasound unless there is consolidation. However, this limitation paradoxically turns into a diagnostic advantage when doing lung ultrasound because of the characteristic artifacts such as A and B lines. How is lung ultrasound performed? 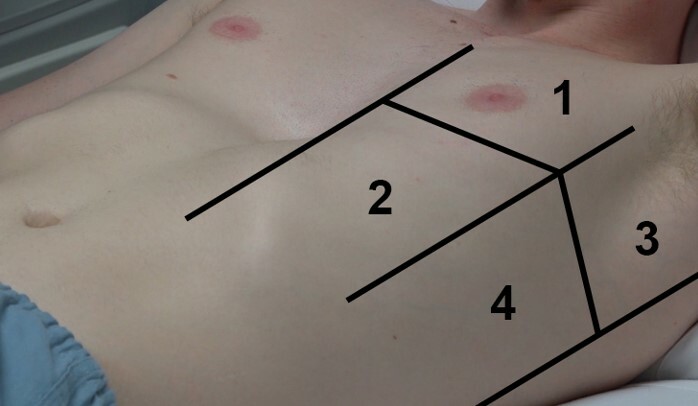 We typically evaluate 4 sonographic lung zones on each side delineated using parasternal line, anterior and posterior axillary lines and a horizontal line about the level of third intercostal space as shown in Figure 1. Areas 1 and 2 denote the upper anterior and lower anterior zones, whereas areas 3 and 4 denote the upper lateral and basal lateral zones, respectively. Examination typically begins in the mid-clavicular line at the 2nd or 3rd intercostal space, with the probe marker pointing towards patient’s head and the probe aligned as perpendicular to the chest wall as possible. Either abdominal (curvilinear) or the cardiac (phased array) probe can be used to evaluate the lung. Cortex of each rib reflects ultrasound waves and blocks their transmission, creating rib shadows. They form important landmark because we evaluate the space in between two rib shadows, that is ‘rib interspace’. In this rib interspace, parietal and visceral pleurae appear as a single hyperechoic pleural line just deep to intercostal muscles. This line will oscillate or shimmer representing pleural sliding. Presence of sliding tells us 2 things: there is no air in between the pleural surfaces and the lung volume is changing with respiration. Pleural sliding will be absent if the patient has pneumothorax, pleurodesis or during breath holding. In patients with elevated BMI, hyperechoic fascial layers and linear subcutaneous tissue can mimic pleural line. 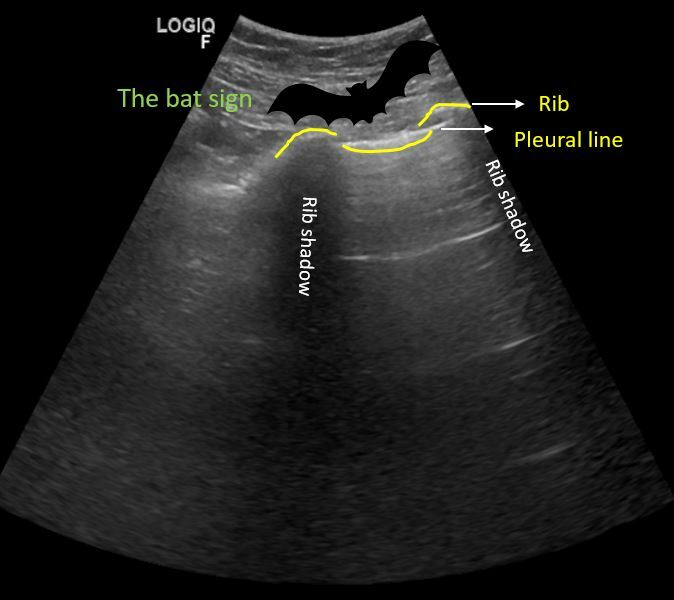 But remember that pleural line is deep to the ribs forming a ‘bat sign’, where the periosteum of the ribs represents the wings and the bright hyperechoic pleural line in between them represents the bats’ body (Figure 2). In normal aerated lung, hyperechoic, horizontal lines arising at regular intervals from the pleural line can be seen, which are called A-lines. These are reverberation artifacts that arise when the ultrasound beam reflects off of the pleura and, instead of entering the probe, partially reflects off of the probe face back to the pleura again before getting back to the machine. This double-length pathway is interpreted and displayed as if the source of the echo lies at two times the distance between pleura and skin because, the distance at which a particular structure is displayed on the screen depends on how long the echoes returning from that structure take to reach the probe. Multiple reverberations result in multiple A-lines, at multiples of the pleural depth (Figure 3). In short, if you see A-lines, the lungs are filled with air. B-lines are defined as discrete laser-like vertical hyperechoic artifacts that arise from the pleural line and extend to the bottom of the screen without fading, move synchronously with lung sliding and erase A-lines (Figure 4). They used to be called “comet tails” and “lung rockets” in the past, and this terminology is obsolete now. B-line formation is incompletely understood but they are believed to be a subtype of reverberation artifact, called the ring-down artifact. In case of increased lung water/edematous interlobular septae, the ultrasound beam encounters a unique arrangement of air-water interface: fluid trapped between a tetra-hedron of air bubbles. The ultrasound energy then creates vibrations within the fluid creating a continuous sound wave that is transmitted back to the transducer. This is displayed on the monitor as a streak or series of parallel bands appearing as a single vertical hyperechoic line or the B-line (Figure 4). Do B-lines always indicate pulmonary edema? Multiple B-lines are considered the sonographic sign of pulmonary interstitial syndrome, and their number increases along with decreasing air content and increase in lung density. When the air content decreases further as in consolidation, the lung may be directly visualized as a solid parenchyma, similar to liver or the spleen. Occasional B-lines, especially in the dependent zones of the lung are not abnormal. 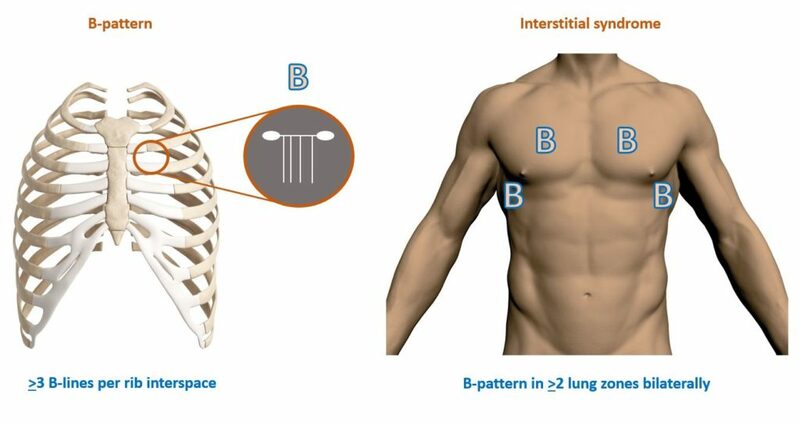 The presence of three or more B-lines per rib interspace in a longitudinal plane is abnormal and constitutes “B-pattern”. B-pattern in two or more sonographic lung zones bilaterally is suggestive of “interstitial syndrome” (Figure 5). This term encompasses pulmonary edema of various causes, interstitial pneumonia and diffuse parenchymal lung disease (e.g. fibrosis). In case of diffuse B-line pattern, whether you are dealing with pulmonary edema or fibrosis largely depends on the clinical context. However, findings such as irregular, fragmented pleural line, sub pleural abnormalities appearing as small hypoechoic areas and nonhomogeneous distribution of B-lines favor fibrosis. On the other hand, “focal” B-line pattern may be seen in pneumonia, atelectasis, pulmonary contusion, pulmonary embolism, pleural disease and malignancy. Excellent article. Many thanks for the POCUS instructional videos as well. Please add pdf download option for these topics..